On the southern end of Anastasia Island, Crescent Beach is regarded by many as the most gorgeous beach in all of Florida. 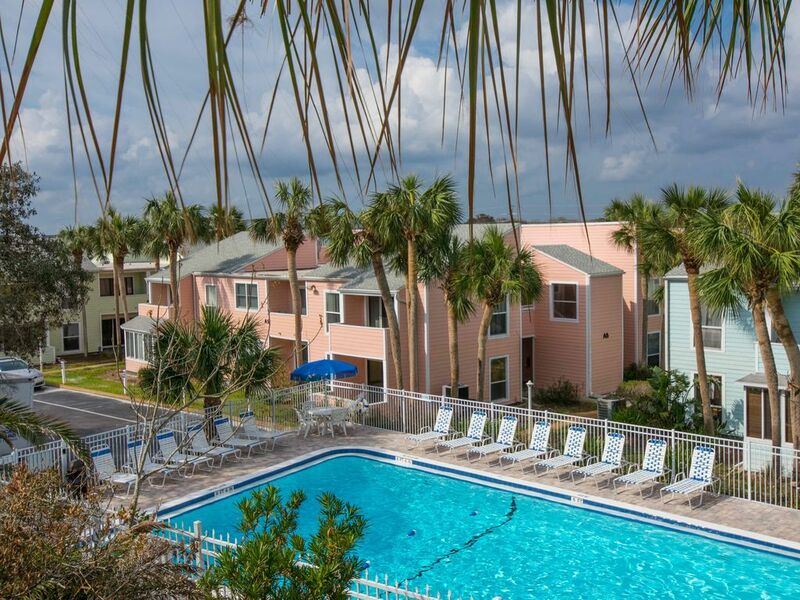 Enjoy and relax in an OCEANSIDE (no view of ocean) ground floor condo located adjacent to the pool. Take a three-minute walk and you are on a beautiful white sand beach. Master bedroom is furnished with a king-size bed and the second bedroom has two twin-size beds. There is a sleeper sofa in living room with a queen-sized pull out bed. Two full bathrooms and a well appointed kitchen with all new cabinets and appliances including an extra large capacity washer and dryer. The living room has a 52” television with satellite dish, Blu-Ray DVD player, and a BOSE docking station. The master has a regular DVD player as well. A nice sunny patio with table, chairs and umbrella is off the livingroom. There are both a gas and charcoal grills for community use. Erin Steinbach, secretary at a state school in upstate New York. We absolutely love the quiet, family friendly quality of Quail Hollow on the Ocean. The pool and ocean are just steps away from our door! 50 min, from Jacksonville Airport (JAX), 12 Golf Courses nearby, Ghost Tours of St, Augustine, Ripley's Believe it or Not Museum, The Alligator Farm, St, Augustine Lighthouse, Take a tour on the trolley or on a horse drawn carriage, 1, 5 hours away from Orlando, 45 min drive to Daytona, take a cruise on Matanzas Bay, visit the Fountain of Youth, shop on quaint St, George Street, visit the site of the first Roman Catholic Mass held in North America, World Golf village with Hall of Fame just north of the city, Kennedy Space Center 1, 5 hours away, or just lie on the beach and take it easy!